Install this 2-piece toilet from American Standard in your bathroom for a splash of style and coziness. Create less water waste with the single-flush system. Give your bathroom an elegant touch with this toilet made from white vitreous china. Optum Vormax 2-Piece Single-Flush Elongated Bowl Toilet in White Install this 2-piece toilet from American Standard in your bathroom for a splash of style and coziness. Create less water waste with the single-flush system. Give your bathroom an elegant touch with this toilet made from white vitreous china. 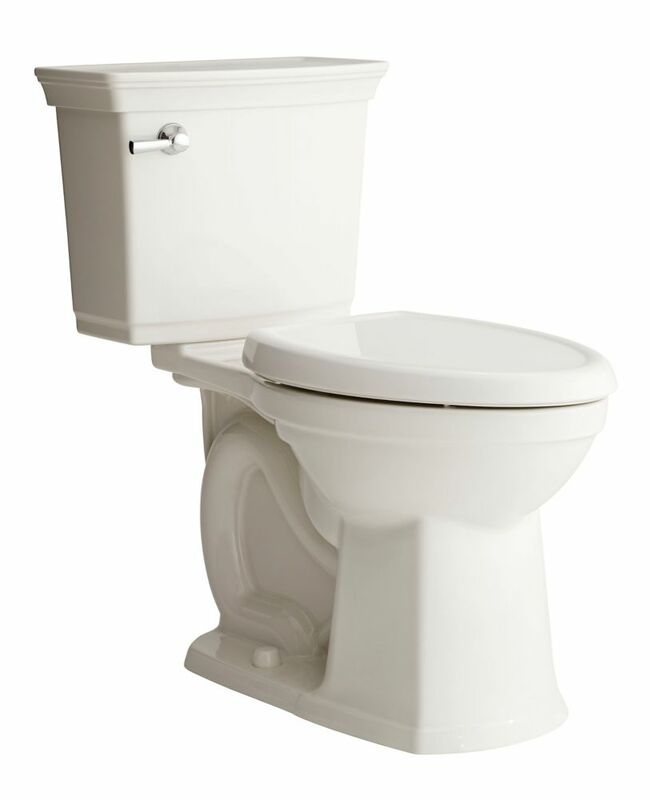 Optum Vormax 2-Piece Single-Flush Elongated Bowl Toilet in White is rated 3.6 out of 5 by 53. Rated 5 out of 5 by Wayne63 from Powerful flush I bought the first one to replace a dual flush toilet which you would have to flush 2 or 3 times or get plugged because the goose neck trap is too small. So much for water conservation!Replaced it with the Vormax and it reminds me of the old toilets which flushed like Niagara Falls. Liked it so much ,I bought a second one . In regards to the negative comments posted, you need to read the instructions and flush it 5 times after install to remove any air pockets. Rated 1 out of 5 by Unhappy Vormax user from i got the dud Does not flush properly. Worked for year then slowly got worse and worse. Now leaks continuously. Changed wax seal, made many adjustments for water level and lever as per troubleshooting instructions, then toilet worked temporarily but now not even temporarily. Last cheap builders toilet lasted 10 years before changing flapper. should have heeded previous cx negative reviews. Very disappointed in this model but am happy with my cheaper American Standard toilets bought for other washrooms. I checked for flapper seal and the USA Home Depot(HD) stocks it not Canadian HD so HD not really backing Canadian consumer. Anyways I took the gamble and lost so very unhappy about Optum Vormax 2-piece. Rated 5 out of 5 by Robert from Attractive and efficient Two months in, we are very happy with this purchase. Quiet, quick, self-cleaning flush. Great buy. Rated 3 out of 5 by Drewski from Has potential to be great. More work needed. I bought three of these to replace all toilets in my house. So far only one is installed. Be aware of air locks the first time you flush the toilet. It will appear as if there is very little force when flushing. This problem corrected after a couple of flushes. Also, I was disappointed that this toilet has an unlined tank. My fault for not checking before purchasing. On the other hand, condensation is an age old problem with toilet tanks and insulated lining should be a standard feature (in my humble opinion). I am concerned that there are reviews here reporting of: -issues with the valves failing prematurely. -the soft close seat failing early in the toilet life and no replacements available. -too many complaints of poor customer service (under staffed?) It is too early to say if I would recommend this toilet but I am nervous that I have bought three of them and there are some significant concerns voiced in these reviews. Rated 5 out of 5 by BDK2 from Easy to install and works well We've had about 2 weeks. It was easy to install and despite use of lots of toilet paper, flushes very well. Rated 1 out of 5 by davesja from Big mistake We purchased three of these toilets figuring spending more would mean a superior product, not so. The toilets however do stay clean as stated and they do assemble well except for the tiny undersized flange bolts (had one break). The flushes are inconsistent and now one of the flapper valves is leaking. As I write this I have been on hold with American Standard Canada support for 40 minutes now and about to hang up (give up). Terrible customer service and we will not be purchasing any more A.S. products. Rated 5 out of 5 by Product research lover from Best flush ever! On the morning of a dinner party we had to rush out to get a new toilet as the one we had was jammed with a stuck toothbrush as well as a lot of calcium deposits. We chose this and had it installed in record time. I want everyone to know that the entire dinner party came up to admire the flush! I want everyone to know that this toilet’s flush is totally different from regular toilets. There are NONE of those holes under the rim that get dirty and make for messy cleaning. The Vormax system utilizes a great swirl from the side of the bowl that removes everything and keeps the bowl cleaner than you could imagine. I can’t recommend this toilet strongly enough. As far as the seat it comes with? It is lousy. Weak and concaves when you sit on it. And who does NOTsit on the seat sometimes??? I used my for TOTO toilet seat which is sturdy and fits on this toilet. In fact, I doubt I would ever use any other toilet seat. FYI...buying another one of these for the cottage. Rated 5 out of 5 by butchnanne from Flushes everything with a lot less water, Flushes in a swirl so everything goes and it stays clean. The higher seat is much more comfortable. We liked it so much we replaced the toilets in both bathrooms. Does the tank come with a liner? Has anyone experienced condensation on the tank exterior? There is no liner in this tank, which is a major under sight in engineering. &nbsp;Water temperature in northern regions is cold at most times in the year and will condense on any tanks. &nbsp;American Standard Engineers (and other manufacturers please take note and make necessary improvements!!). &nbsp;This is a no brainer. Does this toilet have a 2 inch or 3 inch flush valve ? Does this come with a toilet seat, or is that a separate purchase? It does come with a seat and that's the curse. The soft-close on the seat fails (see the reviews) and then you can't replace the seat. They don't sell it. The phone number they provide puts you on hold for eternity then hangs up on you. You are stuck with a toilet seat that doesn't work. I wish I had not purchased this. The strongest flush would be the Champion toilet. What exactly is &quot;Comfort Height&quot; in inches from floor to top of bowl rim?